The core clock machinery has been identified in nearly every peripheral tissue. The master clock in the SCN synchronizes the functions of these peripheral clocks through neuronal and humoral signaling.9 As well, body temperature, rest-activity cycles, and feeding cycles contribute to entrainment of the peripheral clocks. Although the relationship between the central and peripheral clocks has been described as co-dependent, the peripheral clocks do not respond identically to cues from the SCN.10–12 Thus, study of the clock in individual tissues is necessary. 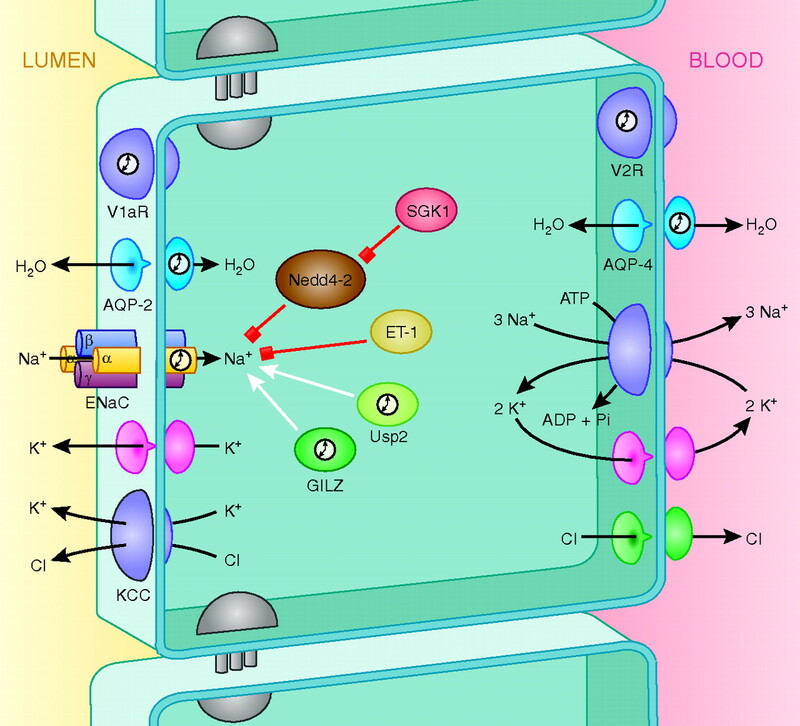 The role of circadian rhythms has recently been reviewed for the cardiovascular system,13 the vasculature,14,15 metabolic syndrome,16 and the gastrointestinal system.17 Here we examine the clinical and molecular evidence supporting a critical role for the clock in the control of renal function. Several reports link aldosterone signaling to the disruption of circadian BP patterns, suggesting a role for renal function in maintaining normal circadian changes in BP. Patients suffering from aldosteronism exhibit the nondipper pattern,22,23 and treatment with the angiotension II receptor blocker, irbesartan corrects the nondipper pattern in salt-sensitive hypertension.24 The diuretic hydrocholorothiazide restores an appropriate decrease in nocturnal BP in nondipping patients but had no effect in dippers.25 Furthermore, dietary sodium restriction re-establishes the nocturnal dipping pattern.26 Nondipping associates with an increased risk of nephropathy27 and chronic kidney disease.28 Importantly, renal transplantation can rescue the nondipping phenotype,29 although a lack of nocturnal variation can portend poor allograft survival.30 Collectively, these findings suggest a direct link between abnormal circadian patterns in BP and inappropriate sodium transport in the kidney. Salt handling by the kidney has long been recognized as a critical determinant of BP, and hypertension is rarely observed in the absence of renal dysfunction.31 A decline in renal function directly correlates with a nondipping phenotype. A well-controlled study showed that creatinine clearance declines more rapidly in nondippers compared with dippers, and urinary protein excretion is greater in the nondippers compared with dippers.32 The nondipping phenotype also associates with a faster decline in renal function, and the authors suggested that regulation of nocturnal BP should be an additional goal of anti-hypertensive treatment. Similarly, Agarwal and Light33 determined that a nondipping status was a significant predictor of chronic kidney disease and proteinuria and inferred that correction of dipper status could be an effective therapy for kidney disease. Taken together, these studies showed the important relationship between renal physiology and the circadian pattern of BP. The potential benefits of chronotherapy in the treatment of hypertension include control of BP and normalization of the dipping pattern.44 Cross-sectional and longitudinal studies consistently show that nondipping is a preclinical marker for cardiovascular and renal disease and can be used to predict cardiovascular events.45 Indeed, accruing evidence suggests that nighttime BP is a more important indicator of cardiovascular health than daytime values.46,47 One example comes from a convincing study in which previously untreated hypertensive patients were randomized into groups receiving a single daily dose of ramipril either in the morning or at bedtime.48 BP during sleep was significantly reduced in bedtime-dosed patients compared with morning-dosed patients. Notably, nighttime dosing also increases the effectiveness of ramipril as BP reduction lasted 24 hours after bedtime dosing compared with 16 hours after morning dosing. In addition to a role for the kidney in maintaining proper BP rhythms, renal function oscillates in a circadian manner with daily fluctuations in renal blood flow and GFR58 and the excretion of electrolytes such as sodium and potassium.59 Likewise, urinary excretion of phosphate, magnesium, and acid oscillates with a circadian pattern.60,61 Although these clinical observations have been well established, the underlying molecular mechanisms are unclear. A growing number of genes are regulated by transcriptional mechanisms of the circadian clock. Many clock-controlled genes have been identified in the kidney through either gene expression profiling or candidate gene approaches (Table 1). The term “clock-controlled gene” is used here to describe genes that exhibit rhythmic expression. Most of the genes listed in Table 1 have only recently been linked to the circadian clock, and it remains to be determined whether circadian clock proteins interact with E-box elements in the promoters of these genes. The circadian clock gene Period 1 (Per1) was identified as a novel aldosterone target in a murine inner medullary collecting duct cell line and was the most highly induced transcript in the entire study.67 Per1 contributes to the basal and aldosterone-dependent transcription of Scnn1a, which encodes the rate-limiting subunit of the epithelial sodium channel.68 Scnn1a expression is reduced in the renal medulla of Per1 null mice. Per1-null mice excrete more urinary sodium than wild-type mice, although the mechanism of this effect is unknown. The apparent circadian expression of Scnn1a is also altered in mice lacking all three Period genes compared with wild-type mice. Given the critical role of the rate-limiting subunit of the epithelial sodium channel in sodium transport and BP control, these results implicate the clock in the mechanism underlying the known daily fluctuations in sodium excretion and BP. Many renal transport genes have been identified as clock-controlled genes (Table 2). NHE3 was the first transporter in the kidney to be identified as a target of the clock transcription mechanism.69 mRNA encoding NHE3 is expressed in a circadian manner in wild-type rodents, but rhythmic expression is blunted in Cry1/Cry2-null mice. A specific E-box response element is required for Bmal1/Clock-mediated transactivation of NHE3 promoter activity. Consistent with this observation is a recent report describing the presence of an E-box in the Scnn1a promoter that is bound by Clock and Per1.70 Together these studies provide direct molecular evidence for regulation of transport gene expression by the circadian clock. In the first study of its kind, Zuber et al.64 used microarray analysis to profile the expression of circadian genes in microdissected distal nephron and collecting duct segments over a 24-hour period. Hundreds of putative clock-controlled genes were identified. Circadian expression of selected genes was confirmed in independent samples, and these genes are included in Tables 1 and 2. These novel clock targets encode moieties ranging from known regulators of sodium transport to critical regulators of water balance. Many of the genes listed in Table 2 are expressed in principal cells of the cortical collecting duct, and the products of these genes contribute to sodium and water transport (Figure 2). Further study will likely identify additional clock-controlled genes, providing additional insight into the mechanism by which the circadian clock regulates water and electrolyte transport in the kidney. Casein kinase Iε-mediated phosphorylation controls stability of the Period proteins. tau mutant hamsters have a gain-of-function mutation in casein kinase Iε and display a shortened circadian period. Heterozygous tau mutants display a severe cardiorenal phenotype characterized by cardiomyopathy, hypertrophy, cardiac fibrosis, and early death71; renal dysfunction is manifested as proteinuria, tubular dilation, glomerular ischemia, and cellular apoptosis. SCN ablation in young adult tau mutant hamsters rescues the cardiac hypertrophy phenotype. Moreover, the cardiorenal phenotype is reversed and longevity is restored when the tau mutants are maintained on a shorter 22-hour light/dark cycle. The mouse renin transgenic rat [TGR(mREN2)27] is also a well-characterized model of hypertension. These animals have an inverted circadian BP profile and consequent end-organ damage.72 TGR rats exhibit a profound circadian phenotype in which the normal circadian pattern of core clock gene expression, signal transduction pathways, and sympathetic nervous system activity is altered severely.73 Consistent with human studies discussed above, the renin-angiotensin-aldosterone system contributes to maintenance of circadian rhythms in rodents. Reports of BP phenotypes in rodents with circadian clock disruption suggest that the clock is critical for cardiovascular function. Whereas Clock-null mice maintain a normal 24-hour rhythm of BP, the average mean arterial pressure and mean systolic BP were significantly lower in these mice compared with wild type.64 These mice display altered rhythms in urinary sodium excretion and a mild diabetes insipidus. When maintained on a standard 12-hour light/dark cycle, Per2 mutant mice exhibit decreased 24-hour diastolic BP, increased heart rate, and a decreased difference between day and night BP.71 Under constant darkness, wild-type mice maintained normal 24-hour rhythms in BP, activity, and heart rate, but Per2 mutant mice experienced a shortened circadian period. Salt-sensitive hypertension was observed in Cry1/Cry2 knockout mice.75 Elevated plasma aldosterone levels were observed in these mice, leading the investigators to perform microarray analysis of adrenal glands from Cry1/Cry2-null mice compared with wild type. Hsd3b6, a dehydrogenase-isomerase in the aldosterone synthesis pathway, was identified as a highly overexpressed gene in null mice. Increased activity of this enzyme was recorded in Cry1/Cry2 knockout mice and was linked to the observed salt-sensitive hypertension. Importantly, this study identified a putative target for interventional therapy in hypertensive patients. Given that the HSD3B6 enzyme catalyzes a relatively early reaction in the steroid hormone synthesis pathway (pregnenolone to progesterone), it will be interesting to see what other steroid hormones are elevated in these mice and how this defect influences the long-term health of these circadian mutant animals. A critical issue is what proportion of circadian fluctuations in renal function is caused by the influence of the central clock in the SCN versus an intrinsic clock in the kidney alone. Renal tissue explants from Per2/luciferase transgenic mice oscillate in culture, and this effect is maintained after SCN ablation.10 Uncoupling of the peripheral clocks from the central clock by food restriction is another way to address this issue. Reversal of the light/dark cycle and the feeding schedule causes a phase shift in the expression of clock genes in rat kidney.76 Per1 and Clock appeared to be the most sensitive to these changes. An important tool in determining the role of the clock in individual tissues is the generation of tissue specific null mice. Indeed, pancreas-deficient Bmal1 mice develop diabetes mellitus,77 and knockout of Clock in cardiomyocytes alters the normal circadian rhythm of cardiac output, heart rate, and BP.7 Future studies using kidney-deficient clock genes will be critical to our understanding of how the circadian clock regulates renal function. In addition to the transcriptional and post-translational regulation of the clock mechanism discussed above, microRNAs (miRNAs), which regulate mRNA stability and therefore protein expression, may play a role in the modulation of circadian rhythms.78 In mammalian cell models, miRNA-192/194 regulates the expression of the Period gene family.79 Overexpression of this miRNA causes a shortened circadian period. Very little is known about post-translational control of clock proteins in the kidney,80 and the role of miRNAs in the renal circadian clock has not been explored to date. These dynamic processes likely allow fine-tuning of the clock mechanism in a tissue-specific manner. Discerning the role of the circadian clock in the kidney has important implications for the design of novel therapies and improvement of existing treatments for renal disease. Numerous trials showed that chronotherapy in the treatment of nondippers is effective in restoring the normal 24-hour rhythm of BP in many patients. Improved use of 24-hour ambulatory BP monitoring could increase identification of nondippers that may benefit from nighttime administration of anti-hypertensive medications. Nighttime dialysis may benefit patients experiencing circadian disruption. To identify those patients most likely to benefit from chronotherapeutic intervention, we must gain a more complete understanding of the mechanism by which the circadian clock regulates renal function. We thank Dr. Charles Wingo for helpful discussions. This work was supported by Grant K01DK085193 (to M.L.G. ).